These eye-popping Halloween decorations are simple to create, spooktacular and won’t cost you an arm and a leg, unless you want to lose them in your Halloween decor! We have collected a few of these ideas to kick start your creativity. 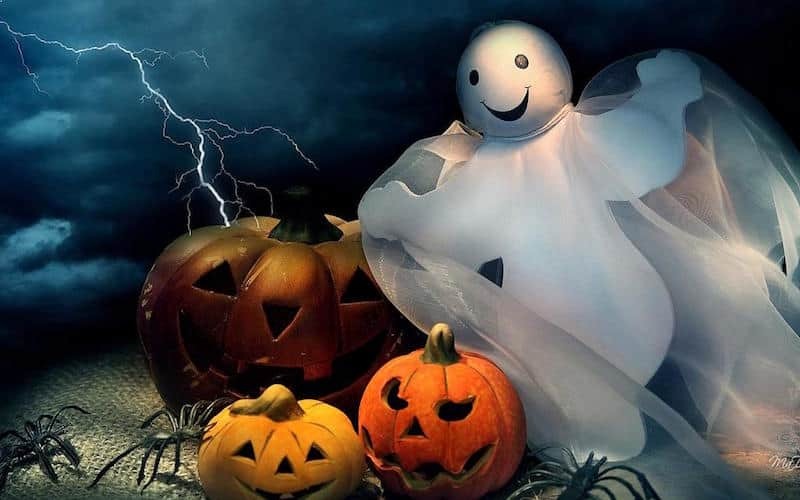 These eye-popping Halloween decorations are simple to create and won’t cost you an arm and a leg, unless you want to lose them in your Halloween décor! Bring out your dark and evil sides, oops, we meant your creative side and have fun with your kids on these projects. 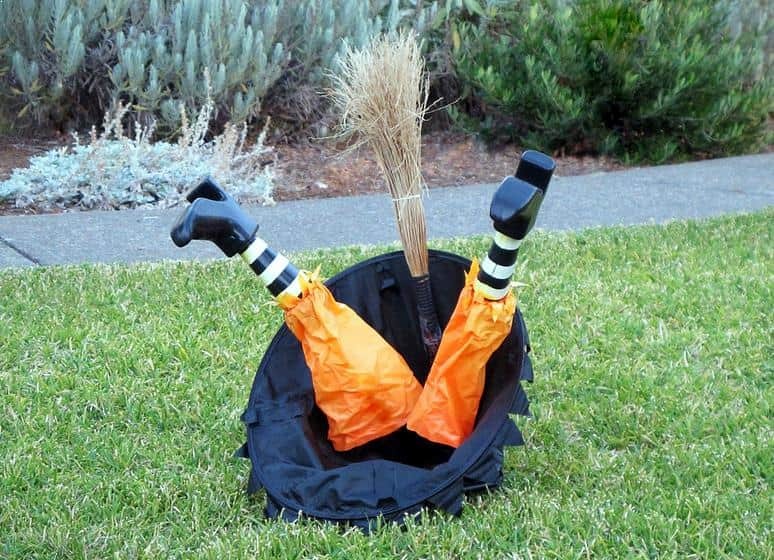 Turn your front lawn to be a landing field for witches, bad-landing witches they are. 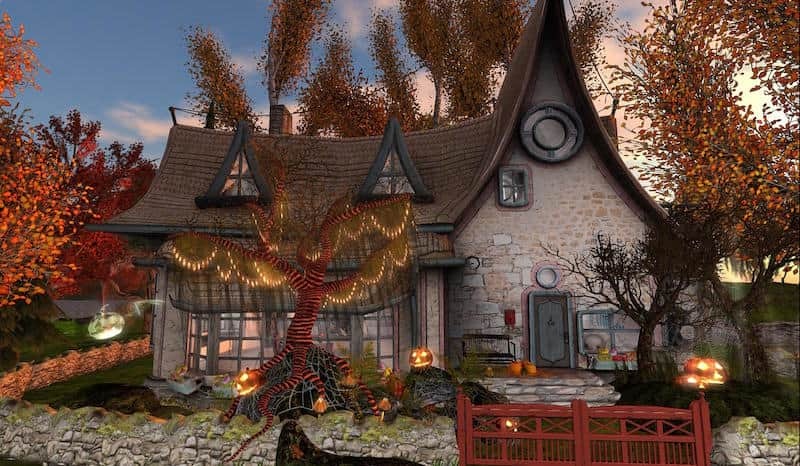 It sets a fun Halloween scene for kids going for trick and treats. This decor requires a witch hat, a pair of witch legs (or if you have the time, use a pair of stripe socks, fill them up with pool noodles, use an old pair of garden boots or rain boots to finish the look), a witch broom stick. Assembly on these items on your front lawn, use stakes to secure them. The Peanuts gang celebrates Halloween while Linus waits for the Great Pumpkin. If you are a fan of the comic strip Peanuts by Charles M. Schulz, you will love this Halloween decoration setup of "The Great Pumpkin". 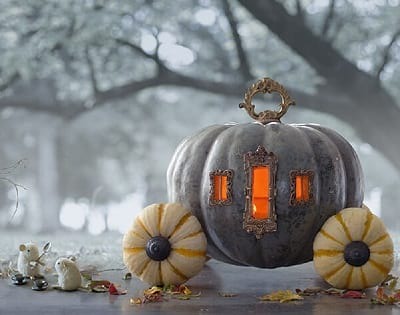 To steal this decor, you can get the foam pumpkins from the craft store, paint (or spray paint) them to silver. Collect fall leaves around your house or neighborhood if you don’t want to spend extra on the leaves. 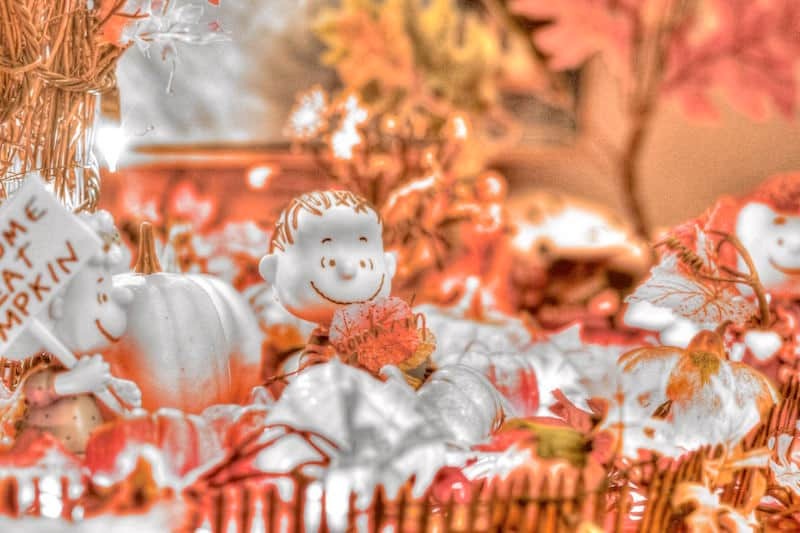 Arrange Linus & Lucy figures in the middle of the pumpkins & leaves. One witch might not be scary enough, how about 3 of them? This garden set up was taken from a pumpkin patch at a farm. You can do the same for your front yard Halloween decoration. 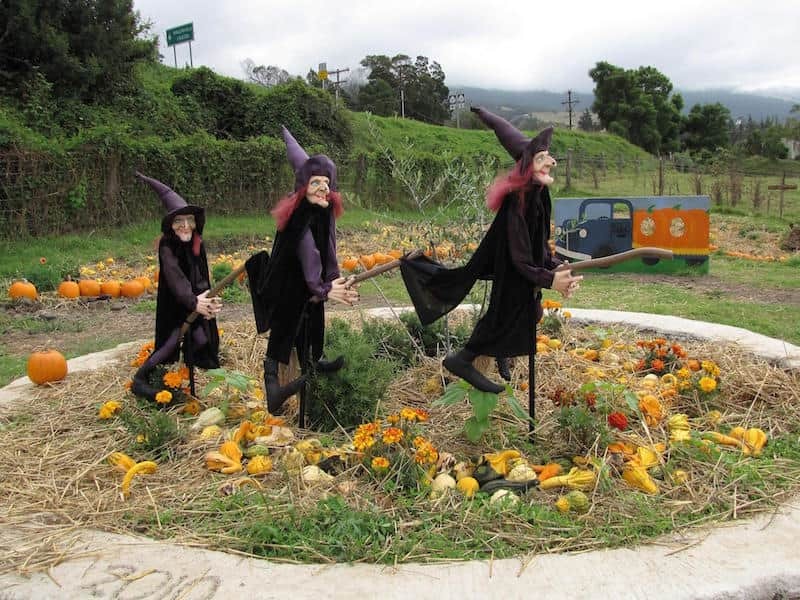 To make it easy on yourself, use store-bought witch figures; support the figures with long & sturdy sticks. Decorate the surrounding field with pumpkins, hays or heaps of Fall leaves. 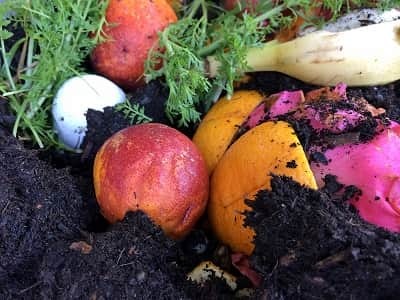 Instead of throwing the beautiful Autumn-color leaves in the garden trash bin, add them to your front yard decoration. There are so many Halloween decoration ideas we can create from using pumpkins. No wonder pumpkins are a hot commodity during Halloween time, not just for consuming as food but as decoration purposes as well. According to CNN news, in 2014, 49.5 acres of pumpkins were harvested during Halloween season that year. 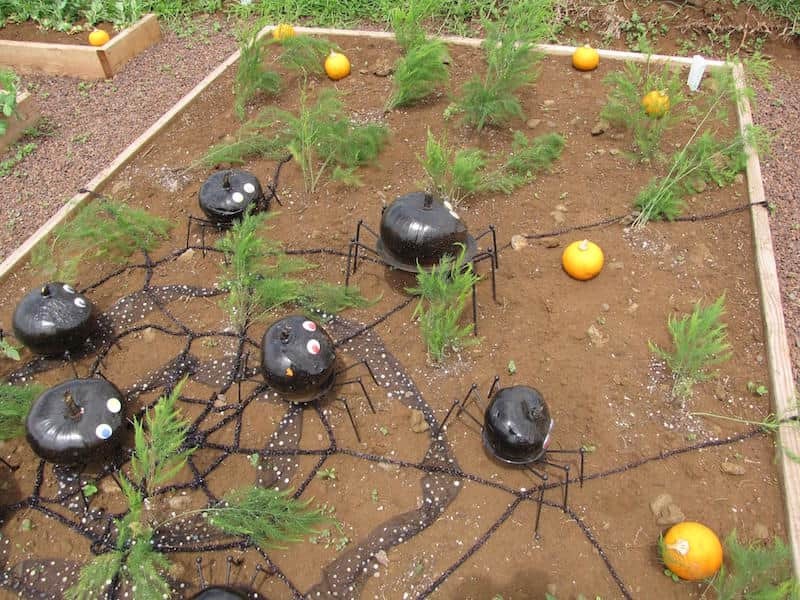 These pumpkin spiders look spooky and very highly custom-made. Copy exactly this look in the photo might be a challenge. But lucky for us, we’ve found detailed instructions from Home Depot of how to make the spider legs & frame from PVC pipes. Follow their instructions to create the frames, then spray paint your real or foam pumpkins to black. Add 2 white foam circles for the eyes. Arrange them on your lawn with a spider web décor piece. 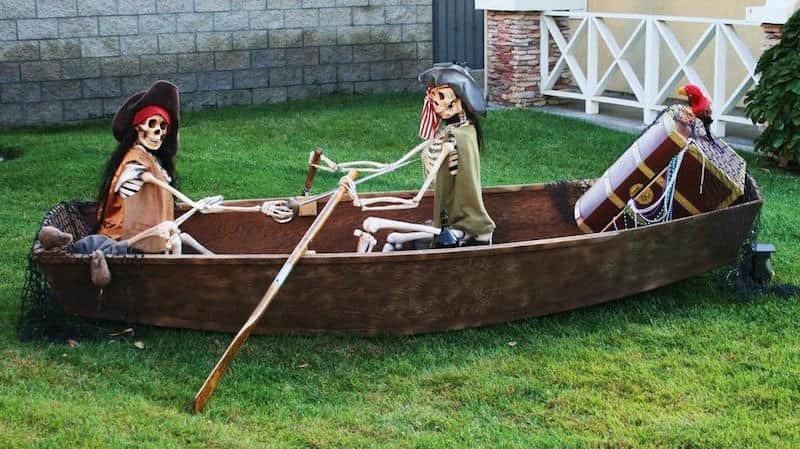 If you are tired of hanging the same old skeletons up as Halloween decors and want to spruce up a bit this year, why not put some accessories and clothes on, creating the look of the ghosts of "Pirates of The Caribbean"? For this scene, all you need is a big treasure box that can be made out of carton board, 2 full-size skeletons, pirate hats, some dragged clothes & accessories (like beet jewelry, cheap ones, of course), a fish net and of course a parrot. 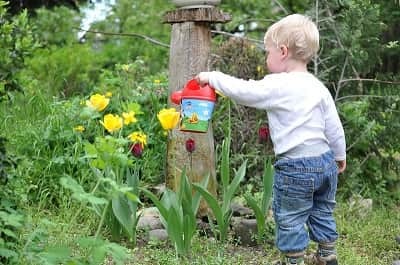 If you don't have a boat or a dingy laying around in the garage, set your skeletons leaning over the fence or a bench set near the door, like they were carrying out a treasure box. You can add some LED lights for the eye sockets to add the spooky effect. This is definitely the easiest one to make as long as you can find a big thick cardboard. If you have a big cardboard box, save it for this project. Cut it into the shape of a ghost. Support the cardboard figure with a strong stake. If you want to add the 3-D effect, use a beach ball for the head, paint it white and paint the face of the ghost the way you like. Cover the entire figure, head ball & cardboard with a big piece of cheese cloth fabric. Tie a robe around the ghost neck to keep the fabric attached to the cardboard. This flowing fabric will create an illusion of a ghost at night, in the wind, floating in the air. Chilling! This Halloween decoration is perfect for your front yard or the entrance way. You can use black card boards or for a more weather-proof, use black foam sheets. If you use the foam sheets, you can stiffen up the bats by applying hot glue around the edges. Hot-glue googly eyes for the bat eyes. 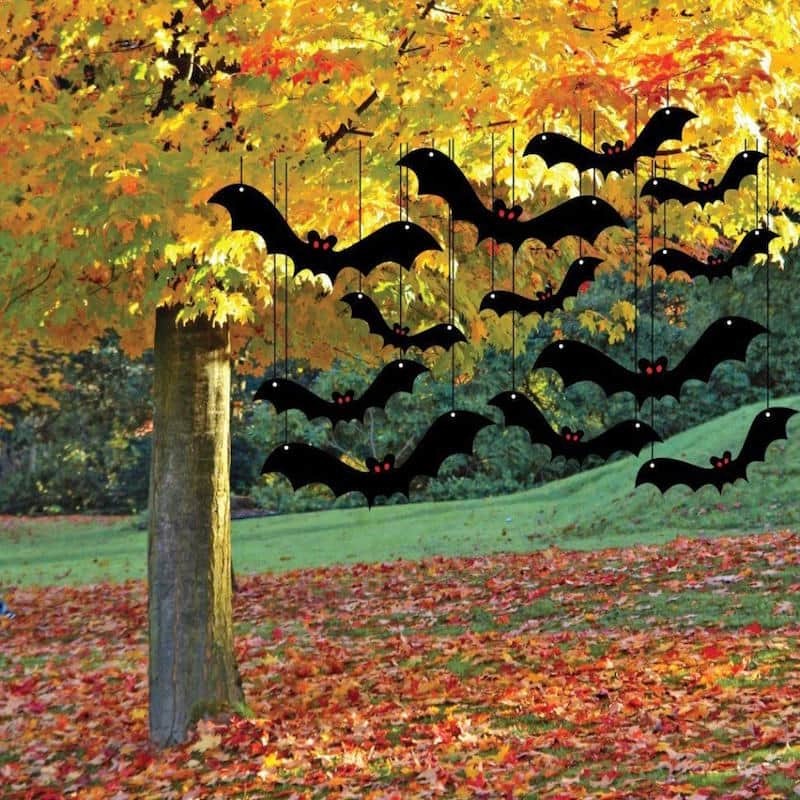 Use transparent fish lines to hang the bats so at night it looks like the bats are flying. 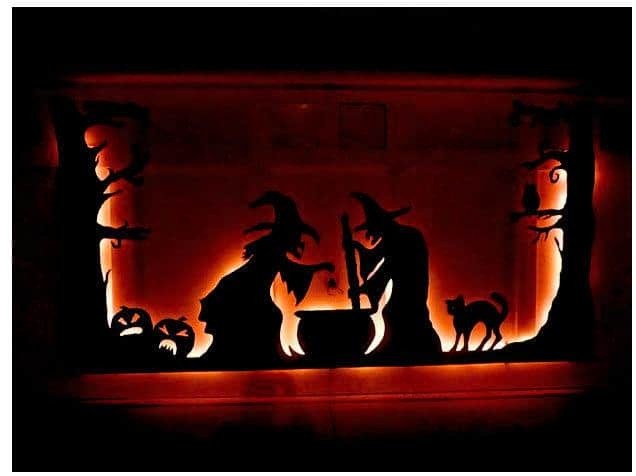 This DIY Witchcraft Halloween decor for garage door is fun to create and makes a big impression for your front yard. This project might be time-consuming, but very doable. You don't need to be an artist to do this. You can set up this set on a plain wall or in front of the garage door, if unattached to the garage or wall, then make sure you add support stand for the structure. 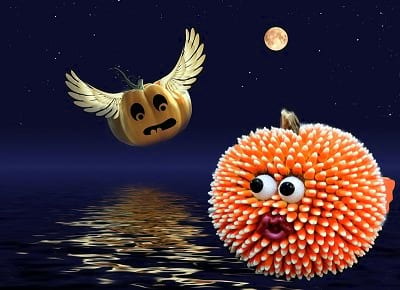 For the 3-D effects, you can add real carved pumpkins with some straws/hays to the set. Do you have an unused mirror stored in the attic or garage? Take it out and we’ll give you an idea how to turn an old, unused mirror to a haunted piece of Halloween art. Another place to scout for an old mirror for this project is your local Goodwill or Thrift stores. To achieve the vintage look, after paint the mirror to black, use sand paper to scrape a few surface of the paint. 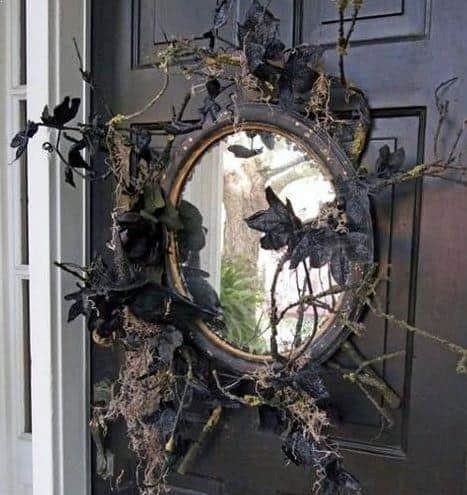 Spray paint some branches and leaves and hot glue them around the mirror. Add a black scarecrow or a skeleton, whichever your heart jumps the most; and be sure to secure the mirror sturdy to the door. This Halloween decor requires just a bit of artistic work on your part. Spray gold paint to pumpkins; touch up with some black paint and scrape the surface lightly for the vintage look. Add the bones and skull for the scary effect.. If you can find a rustic piece of wood, it’ll make the whole art piece more timeless. Paint the text in off-white color on the board. You can put this whole art piece right on the front porch bench. 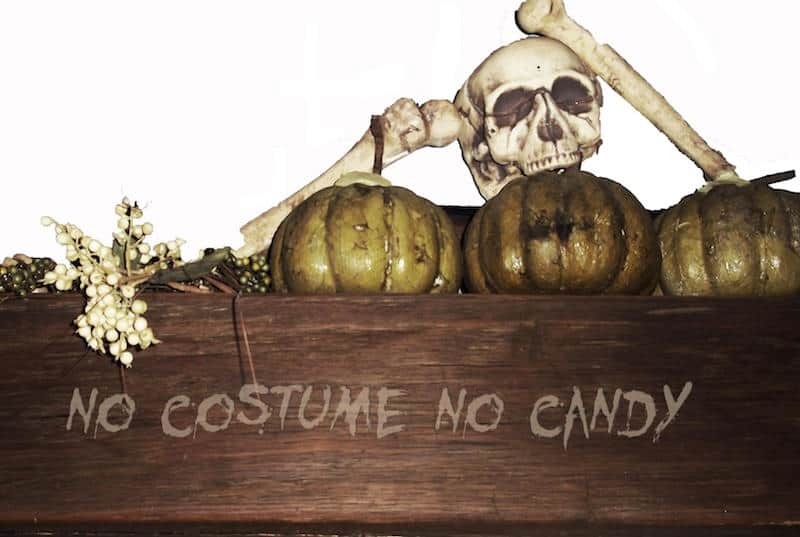 Anyone passes by will take your “no costume, no candy” threat seriously.